Time to discuss the top impressive and amazing fall/ winter 2014-2015 makeup trends we observed during the latest fashion shows. To describe them in short, we may, well, use the word ‘diverse’ as one of the most typical definitions for this range. Looking through the options, we find makeup alternatives for any taste and preference, starting from the classic options like natural vibes to the most experimental and extravagant variants like the ones made of ‘overdosed’ smokey effect. So pointing the main motives one by one we may categorize the fall/ winter 2014-2015 makeup trends as follows! One of the classiest and the most ethereal alternatives we always observe among the fashion shows for any season is the inclination towards natural looks. The most specific thing about this type of makeup this season is that the natural effect has been reached with the most sophisticated and diverse makeup products ever, and the results are, indeed, impressive, coming with the absolutely natural and at the same time chic looks. Some great examples may be found with the collections of Alexander Wang, Victoria Beckham, Jason Wu, Vera Wang, Dolce & Gabbana, Jil Sander, Diane Von Furstenberg, Giambattista Valli, Tommy Hilfiger, Michael Kors, and Lacoste. And what has been the most characteristic aspect of natural makeup has been preserved this time as well, putting the rosy lips and the peachy cheeks as the main accents of the natural effect. The inclination towards paler looks may also be found here, demonstrated as the looks by Dion Lee. Prabal Gurung and Edun also found a cool way of creating the natural makeup. This is the following noteworthy option we observed. Donna Karan’s collection was one of the most specifically punk options we observed. As for Creatures of the Wind, the “Star Wars’ was the concentration here. Rodarte and Alexander McQueen also followed this pattern. Also check out the upcoming Spring/ Summer 2015 Makeup Trends! Military inspired and strict silhouettes were the say of Derek Lam. Matching this inspiration with the graphical silhouettes of the garments and finishing all with the impressively styled eye-makeup, the looks acquired a really unique and impressive result. This is the following everlasting option we always observe during the shows. It is described as an intensification of the eye makeup, creating an impressive and catchy outline all around the eyes and on the lids, and the overall close-to natural finishes for the rest of the face, including the lips and the cheeks. Donna Karan, Bibhu Mohapatra and Nicole Miller introduced some very great exemplars of how to make this work. Fall/ Winter 2014-2015 Makeup Trend #5: When It Comes to Eyes, Opt for Arrows! Arrows were the say of a big number of stylists, who came up with the most diverse and multi-shaped options possible. Turning this classic makeup design into a super modernized and cool alternative, they managed to achieve a charming diversity to pick the best. Thus, Carolina Herrera suggested the subtle and hardly noticeable accents, Mara Hoffman came up with the Egyptian-inspired low arrows outlining the lower lids, Zac Posen suggested another great graphic interpretation. Bright was the say of Marc by Marc Jacobs, the double arrows were the key tricks of Carmen Marc Valvo, whereas the Brigitte Bardot style of the classic arrows was observed during the show of Cushnie et Ochs. As for the colorful accents, we may also turn to the option by Badgley Mischka, and for the top classy ones to Rag & Bone. Fall/ Winter 2014-2015 Makeup Trend #6: Cat Eyes? Yes! When we talk about arrows, we can’t but come to the cat eyes. So here we are introducing this uber feminine and mysterious makeup option as a basic trend for the coming season. For some really memorable interpretations, you may turn to the options suggested by Cristiano Siriano, Karen Walker, Roccobarocco, Simonetta Ravizza, and Jean Paul Gaultier. The interesting and noteworthy option suggested by Jill Stuart and Tanya Taylor is also worth talking about, coming with an innovative and creative solution, the essence of which is creating maximum messy and smeared effect of the eyeshadow applied to both upper and lower lids. Smokey effect couldn’t but be here, too, presented with some ultra-fresh interpretations, coming with maximum innovative approach, in terms of shapes, colors, and combos in general. Thus, the enigmatic and slightly natural-oriented option by Richard Chai, carried out with silver and light blue shades is the first look we would like to note. The totally stunning and exaggeratedly massive up and low highlights Derek Lam opted for is, of course, not a universally acceptable and useable variant, but still it does form another great aspect of the new interpretations. In contradiction with this, Altuzarra and Naeem Khan came up with the top feminine and subtle suggestions, putting the accents on pale yellow and golden shades. You may also have a glance at the collection of Tom Ford for the classic variants, as well as the one by House of Holland, and Topshop. For smoother accents the options by Burberry, Paul Smith, David Koma and Issa are also worth your attention. Coming to color diversity, we may first of all talk about the bluish accents we observed during many fashion shows. Creating an interesting comeback of the ’90s, they produce and effective impression of us for the coming season. Thus Temperley London and Giles are some of the most memorable and expressive exemplars of the successful and creative application of blue for makeup options like smokey eyes. Cynthia Rowley also suggested an interesting combination of the bluish accents with arrows. The same can also be said about the variant by Kenzo. Christian Dior came up with more massively applied eye makeup with glittery finishes. The rounded stripes going in the outline of the upper lids were the key style of the Marchesa models’ makeup. Fall/ Winter 2014-2015 Makeup Trend #10: For Maximum Effectiveness and Enigma Pink Is the Way! Going on with the color diversity, we come to pink accents, which also form a noteworthy aspect of the overall looks. Despite the slightly “inflamed’ effect they produce especially with the lighter tones of skin, such accents are great alternatives for the fresh and different looks. You can do that like Julien Macdonald or Jonathan Saunders for maximum effective outcomes. Smokey is again the main pattern demonstrating this tone. Going on with the interesting interpretations, we may also talk about the ombre technique used for completing the smokey effect and most of the times the bright color tones applied. Ashish, House of Holland, Chanel, and John Rocha are some of the most interesting interpretations in this respect. Fall/ Winter 2014-2015 Makeup Trend #12: Think Lilac! Coming as the following uber impressive and chic interpretation for the color diversity of your makeup, lilac	overtakes the show, offering its charm and elegance to you. Put it like the stylists for Diane von Furstenberg and Burberry Prorsum, and Chloe shows and enjoy your stunning looks to the full! What Thomas Tait presented for the season can be considered the most colorful and bright interpretation of the oversized shadowing and thematically bright tones. The colors here covered the whole space of the lids, in the upper part also expanding to the level of brows and covering them. The painterly options suggested by Lanvin and Alexander McQueen are also worth mentioning here. Fall/ Winter 2014-2015 Makeup Trend #14: Twiggy Lashes In the Focus! The expressively accented and styled eyelashes formed the following impressive aspect of the collections. 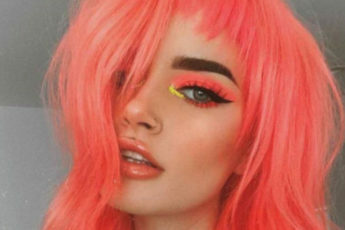 Creating the lower lashes equally catchy and clumped for the retro inspired Twiggy makeup effect, the stylists managed to come up with quite interesting suggestions. Such were the makeup options by Rochas, Custo Barcelona, Marco de Vincenzo, Prada, Gucci, Saint Laurent, Maxime Simoens, and others. The next important aspect about the trendiest makeup options are the brows, this time coming with the natural looks, and interestingly put accents. Being thick, bold, and expressive is one of the most frequently met options. Dion Lee, Rag & Bone, DKNY, Marc Jacobs and 3.1 Phillip Lim, Alexander Wang, Haider Ackerman, Yohji Yamamoto, Junya Watanabe, and Givenchy are some of the most memorable designers having opted for such complementary details. Talking about the basic shades we observed for the lips, we may first of all note the decline of popularity of bloody red shades, which have ceded their place to berry and rosy shades, also presented along with bordeaux shades and other tones of red. Thus for great exemplars of red you may have a nosey at the options offered by Marchesa, Zimmermann, Rebecca Minkoff, and for natural versions at the collections of Reem Acra, Carolina Herrera, Altuzarra, Tadashi Shoji, Marc by Marc Jacobs, Ralph Lauren, and Naeem Khan. This is also very curious and catchy in terms of diversity and chic. For inspiration, look to the fashion shows like Rodarte, coming with bronze lips, Badgley Mischka with golden accents, silver options by Donna Karan and Chanel and just glittery by Altuzarra, and such extravagant solutions as the golden foreheads at Emilio Pucci show, and the one by Simone Rocha. Thus here were the basic fall/ winter 2014-2015 makeup trends meant to gift you with a special touch of glam and beauty this cold season. Have a look at them and get inspired to create the trendiest and the most stylish looks ever!